My Saxophone Concerto was commissioned by Nobuya Sugawa, one of the leading saxophonists in the world today. The world premiere was given by Nobuya Sugawa and the BBC Philharmonic, conducted by Clark Rundell, on May 10, 2006, in Manchester. The work opens in a slightly unusual way which I shall not reveal here. However, the mood of the slow introduction is rather improvisatory – a sort of interplay between the soloist and various sections of the orchestra. The movement proper is fast, rhythmic, sometimes jazzy, sometimes violent, and expresses the diverse landscape of an urban environment. The more relaxed second subject is calmer in mood and more obviously tonal, although each time this settled harmonic world is invaded by subversive elements. But after the gently ‘floating’ slow movement, at the climax of the moto perpetuo finale, the work creates a great, life-enhancing tune, thrusting forward joyously, to close the concerto exultantly. This would surely bring the house down at a Prom! 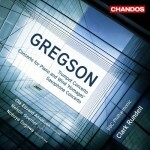 Gregson’s expressiveness really comes across, the solo writing calculated to haul out every morsel of versatility Sugawa has to offer … while the energetic finale further explores the composer’s adaptability and awareness of the saxophone as a solo voice.